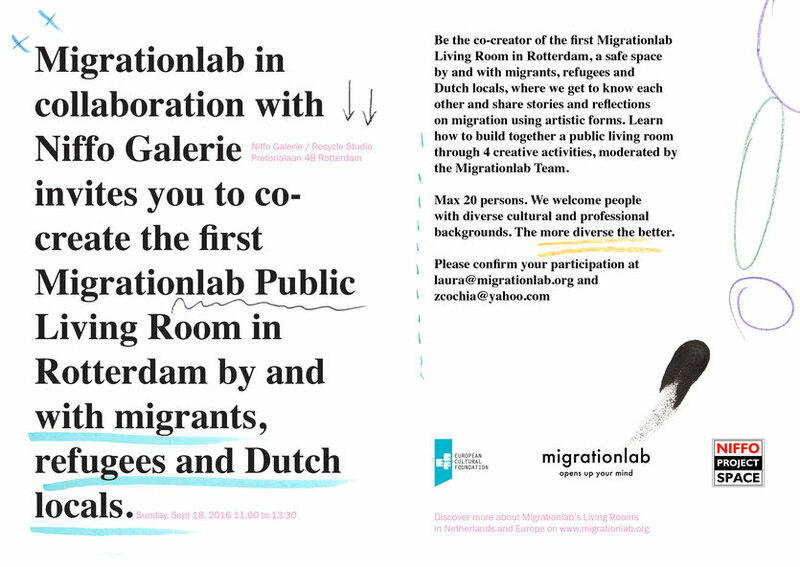 MIGRATIONLAB & NIFFO GALERIE/ RECYCLE STUDIO invites you to create together the first Migrationlab Public Living Room in Rotterdam! Places: 20 persons. We welcome migrants, refugees, Dutch locals, students, expats, travelers, visitors, that is, people with diverse cultural and professional backgrounds. The more diverse the better. Don't be a spectator, be a co-creator! Would you like to take part in the creation of a safe space of encounter, open to everyone, where migrants, refugees and Dutch locals get to know each other, share stories in artistic forms, challenge stereotypes and befriend? Then join our co-design workshop! We will explore how to create together a public living room through 4 creative activities (location, design, storytelling and the importance of creating such a space of encounter), that enable you to freely share your ideas and bring solutions to migration matters in a light, playful yet relevant way. In order to participate in the workshop you don't need to prepare anything and you don't need special skills. The Migrationlab Team will guide you all the way through. Discover HERE our Welcome To The Living Room Co-Design Workshop in The Hague earlier this year and HERE the respective Migrationlab Living Room event co-created according to the workshop. 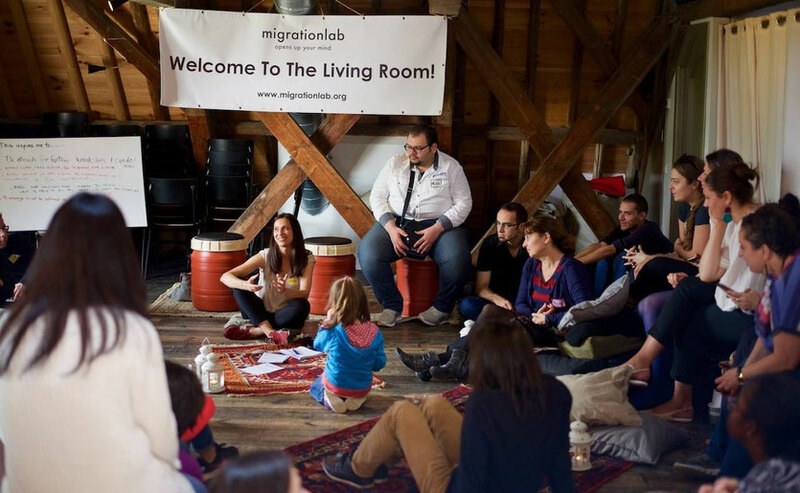 Welcome to The Living Room is a cultural project initiated and organized by Migrationlab since 2014. We transform urban spaces to public living rooms together with migrants, refugees and locals in The Netherlands and other European countries. In these co-created spaces these communities get to know each other through migration stories and reflections using various artistic forms. By simply bringing people together in a welcoming and friendly public living room we easily share, befriend and change our perspectives. Discover our Living Rooms here and here . In 2016 the activities related to this project are enabled by European Cultural Foundation through the R&D Grant.